FREE VALUATION. 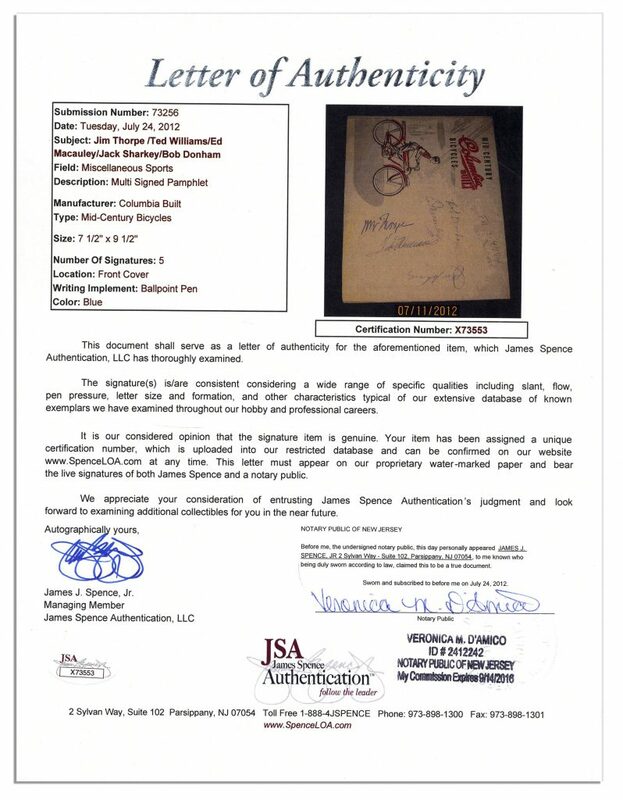 To buy, auction, sell or consign your Jim Thorpe autograph that is for sale, please email Nate@NateDSanders.com or call the Nate D. Sanders Auction House (http://www.NateDSanders.com) office at (310) 440-2982. Jim Thorpe is one of the most adept and multi-faceted athletes in history. He won two gold Olympic medals at the 1912 Olympic Games in Stockholm. He also played football, basketball, and baseball professionally. As a Native American, he was an advocate for his culture and people. Following his sports career, he founded a casting company to influence Hollywood studios to cast Native Americans to portray those roles in television and film. Thorpe’s life was portrayed by Burt Lancaster in the movie “Jim Thorpe – All-American”. Slip signed by a diverse assortment of some of the most extraordinary sports figures of the 20th century. Baseball Hall of Famer “Ted Williams” signs, representing America’s so-called national pastime. Basketball Hall of Famer and MVP of the first All-Star game Easy Ed signs “Ed Macauley”, and fellow hoop star “Bob Dunham” of the Celtics adds his autograph. Heavyweight boxing champion “Jack Sharkey” also signs. Finally, representing football, baseball, basketball, wrestling, running, throwing, jumping, and more, is the signature of “Jim Thorpe”. The Olympic gold medalist in such events as the decathlon and pentathlon is widely considered the best all-around athlete of the century. 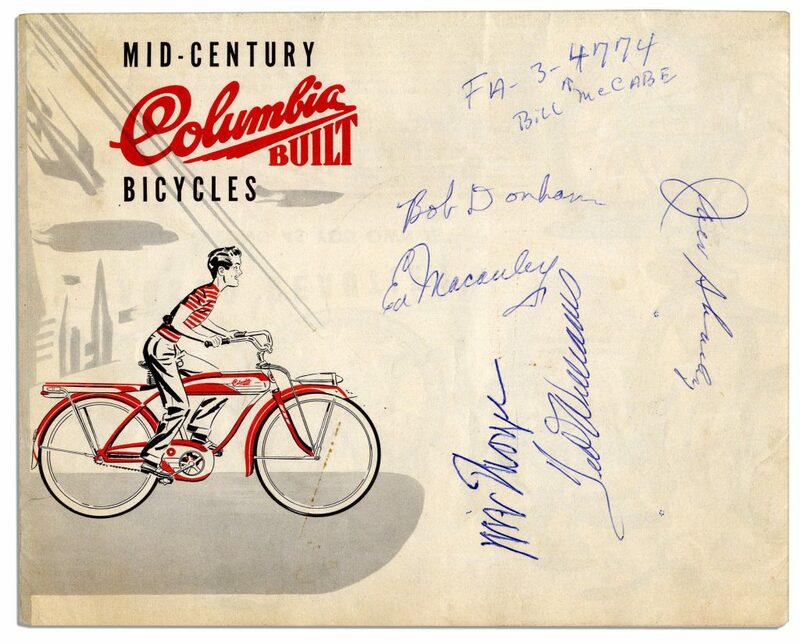 All signatures are in blue ink on a Columbia Built Bicycles advertisement. Signed face of folded ad measures 9.5″ x 7.5″. Unfolds to an overall size of 9.5″ x 15″. Toning, else near fine. With JSA LOA. Document Signed by 20th Century Star Athletes — Jim Thorpe, Ted Williams, Ed Macauley, Jack Sharkey & Bob Dunham — With JSA LOA. Click to enlarge. JSA LOA for Document Signed by 20th Century Star Athletes — Jim Thorpe, Ted Williams, Ed Macauley, Jack Sharkey & Bob Dunham. Click to enlarge.